ACE: The Automated Commercial Environment is the online web portal used to report data to the Automated Export System (AES). AES: The Automated Export System is the system used by the U.S. government to collect data on exports. This data is called Electronic Export Information (EEI) and in many cases exporters are legally required to file the EEI through AES for each shipment. The U.S. Census Bureau uses this data to calculate trade statistics such as gross domestic product (GDP), while U.S. Customs and Border Protection (CBP) uses it to make sure that exporters are following U.S. export regulations. See also, AES Filing Software by Shipping Solutions (Plus 20 Key Terms. Aggregate shipment: Multiple shipments from different sellers to a single consignee that are consolidated by the carrier into a single shipment. Alongside: Refers to the side of a ship. Goods delivered alongside are placed on the dock or barge within reach of the ship’s rigging so it can be easily loaded onto the ship. It’s used, for example, in the Incoterms 2010 trade term, Free Alongside Ship. Apparent good order: When freight appears to be free of damage after being assessed it is said to be in apparent good order. Arrival notice: Notification provided by the carrier when a shipment has arrived to the consignee or notify party. Astern: Can either mean 1) behind a ship, or 2) to move a ship in reverse direction. ATDNSHINC: Stands for “Any Time, Day or Night, Sundays and Holidays Included” referring to when a vessel will operate. Athwartships: A direction across the width of a ship. Automatic identification system (AIS): A satellite system used by ships and vessel tracking service (VTS) to identify and locate ships. Backhaul: Cargo carried on a return journey. Beam: The width of a ship. Beneficiary: The party that receives payment. Bilateral: A bilateral agreement is one in which both parties agree to provide something for the other. Bill of lading: A document issued by a carrier or their agent acknowledging receipt of cargo for shipment. Often abbreviated as BOL, BoL, B/L, or BL. If there were no issues with the cargo stated on the BOL, it is said to be a clean bill of lading. See also, 3 Things You Need to Know about the Bill of Lading Form. Bill of sale: A document that confirms that transfer of goods in exchange for money. Bill-to party: The party paying for goods or services in a transaction. Blocking or bracing: Wood or metal supports used to secure cargo while in transit. Also called dunnage. Block stowage: Loading cargo close together to minimize movement of goods while in transit. Bolster: A piece of equipment attached to a chassis or railcar in order to secure the container. Bond port: The initial port of entry where a vessel transporting goods first arrives at a country. Booking: Arrangements made with a carrier for the movement of cargo; space reservation. Broken stowage: Empty space in a container not occupied by cargo. Bulk cargo: Cargo that is shipped loose as opposed to being shipped in packages or containers. Grain and coal are examples of goods usually shipped as bulk cargo. Bull ring: A device attached to the floor of a container which is used to secure cargo. Cabotage: Transport of goods between two places in the same country by a transporter from another country. Cargo: Any goods being transported, regardless of the mode of transport. Cargo manifest: A document detailing the cargo carried on a ship, often provided to a customs authority. Carnet: A document permitting the holder to temporarily send goods to certain foreign countries for display or demonstration purposes without having to pay duties. Check out, What is an ATA Carnet? Cash on delivery (COD): The sale of goods in which payment is made upon delivery rather than in advance. Carrier: A carrier is a party that transports goods for another person or company and is responsible for any possible loss of or damage to the goods during transport. A common carrier provides transportation services to the public in return for compensation. A contract carrier provides this service under special contracts, often for government clients. CBP: Customs and Border Protection, part of the Department of Homeland Security, is the agency within the U.S. government tasked with controlling the flow of people and goods into and out of the country, and with enforcing import and export regulations. CCC Mark: A label indicating cargo conforms to standards established by the Chinese government. CCL: The Commerce Control List is a list of dual-use items (items that have both a commercial application as well as a potential military application) published as part of the U.S. Department of Commerce’s Export Administration Regulations (EAR). Each item on the CCL is identified with an Export Control Classification Number (ECCN). Knowing the right ECCN for your product plays a role in determining if you need an export license. CE Mark: A label indicating cargo conforms to standards established by the European Union. Certificate of inspection: A document certifying that merchandise is in good condition immediately prior to being shipped. Certificate of origin: A document certifying where goods were originally made, often abbreviated as COO. A COO specific to a particular free trade agreement may be used to claim preferential duty treatment. A generic certificate of origin may be requested by the customs authority of the country of import, in which case the COO must be stamped by a chamber of commerce. CFR: The Code of Federal Regulations is the codification of rules and regulations published in the U.S. Federal Register. Chassis: The base frame of a wheeled vehicle, used to secure a container prior to movement. Chock: Material (often wood) placed next to cargo to prevent excessive movement of the cargo during transit in order to avoid damage. CL: Abbreviation for carload or containerload. Claim: In the context of logistics, a claim is a demand made by a customer to a transportation company for payment in order to compensate for loss or damage of goods. Commercial invoice: A fundamental document for an international transaction with details including what goods are being shipped, who is the shipper, and who is the ultimate consignee. Serves as the basis for all other documents related to the shipment. Commodity: Any commercial good that is shipped. Common law: Law that derives authority from precedent, custom and usage rather than from statutes, particularly regarding the laws of the United States, the United Kingdom, and countries formerly part of the British Empire. Concealed loss/concealed damage: Shortage of or damage to goods shipped that is not immediately evident upon delivery. Connecting carrier: A carrier which acts as an intermediary between two or more other carriers. Consignee: The person or place to whom a shipment will be transferred. The ultimate consignee is the final recipient of the goods, while an intermediate consignee takes possession of the goods for a portion of the time that they are in transit. Consignment: A shipment of goods to a consignee. Consignor: Refers to the exporter or shipper from which the goods originate. Consolidation: When cargo from multiple shippers is combined in a single container. Consul: A government official residing in a foreign country who represents the interests of their home country. Consumption entry: When goods are imported into the United States without any time or use restrictions. The official U.S. Customs and Border Protection (CBP) website states that about 95% of all imports fall into this category. Container: A truck trailer loaded with cargo that can be detached for loading onto a vessel or railcar. Different types of containers exist for different shipping needs. For example, a container may be ventilated, refrigerated, insulated, dehumidified, or equipped with special devices used to secure certain types of cargo. A container shipment is a large shipment, typically over 20,000 pounds. Container load: A load large enough in volume or weight to fill a container. Container manifest: A document stating the contents of a container, its point of origin and point of destination. Vessels may be required by law to produce a manifest for every container being transported. Contraband: Prohibited cargo such as illegal drugs or unauthorized weapons. C-TPAT: U.S. Customs and Border Protection established Customs-Trade Partnership Against Terrorism in November 2001 as a voluntary partnership to help ensure supply chain security. Meeting C-TPAT standards enables faster processing through customs inspections and formalities. Cu. : Abbreviation for “cubic” used when describing measurements of volume. Cube out: Refers to when a container or vessel has reached its volumetric capacity before reaching its weight capacity. Customhouse: A government office where duties are paid and import and export paperwork are filed. Customs: A customs authority, or customs for short, refers to the agency within a government that is responsible for collecting duties and enforcing import and export regulations. Customs bonded warehouse: A warehouse authorized by customs to receive duty-free goods. Customs broker: An individual or organization who helps a shipper navigate customs requirements. Customs entry: A document produced by an importer to declare incoming foreign goods after which the importer will typically pay any import duties. The customs entry statement is compared to the carrier’s vessel manifest to ensure the goods are accurately declared. Customs invoice: A document required by a country’s customs authority which serves the same purpose as a standard commercial invoice but also contains additional information such as a certificate of origin. Customs of the port (COP): A phrase referring to local rules and practices which may impact a shipment. Cut-off time: The latest time cargo may be delivered to a terminal for loading. Dangerous goods: A product may be considered a dangerous good if it is corrosive, flammable, poisonous, toxic, explosive, etc. Shipping dangerous goods may require special documentation or packaging to ensure safety. See also, Hazardous Materials or Dangerous Goods? Dangerous goods declaration: A dangerous goods declaration form is a document produced by an exporter providing details on the dangerous goods in their shipment. When shipping dangerous goods via air, a Dangerous Goods IATA Declaration form is required, and when shipping dangerous goods via sea, a Dangerous Goods IMO Declaration form is required. DDTC: Directorate of Defense Trade Controls (DDTC) is the government agency within the U.S. Department of State tasked with enforcing the International Traffic in Arms Regulations (ITAR), which regulate the export of space- and defense-related products. D&H: Abbreviation for “dangerous and hazardous” cargo. DBA: Stands for “doing business as,” used to specify that a company is doing business under a certain registered name. Deconsolidation point: Location where cargo is separated in preparation for delivery. Deemed export: Transmission of controlled technology, source code, or information to a foreign national at home or abroad. Export regulations apply to deemed exports as well. See, Deemed Exports: Exporting Without Shipping a Product. Delivery receipt: A document signed and dated by a consignee or their authorized agent confirming receipt of goods and stating the condition of the goods upon delivery. Demurrage/detention: Demurrage is a charge to be paid by a shipper or consignee to the carrier as penalty for delaying the carrier’s cargo beyond the allowed free time. Detention is the same as demurrage except that instead of applying to delays in cargo, detention applies to delays in equipment. Denied party screening: Also called restricted party screening or trade party screening, denied party screening is the process of screening potential customers, partners or vendors against denied party lists. These are lists of individuals or organizations that a government has identified as parties that one can’t do business with and that one may be penalized for doing business with. See also, Export Compliance: Understanding Restricted Party Screening. Destination control statement: A legal statement put on a shipping document which specifies that the goods are to be transferred to the ultimate consignee and no other party. Diversion to other countries or parties without prior authorization is a violation of U.S. law. Discrepancy: When documents presented do not conform to the requirements of the letter of credit. Banks will not accept letters of credit which have discrepancies. Diversion: A change made to the route of a shipment or to the route of the entire vessel. Dock: For road transportation, a platform from which trucks are loaded and unloaded. For sea transportation, a cargo handling area adjacent to the shoreline where a ship ties up. Dock receipt: A document used to acknowledge receipt of cargo. Provides the framework for the preparation of an ocean bill of lading. DOT: U.S. Department of Transportation. A U.S. agency within the executive branch which oversees transportation in the U.S.
Drawback: A partial refund of an import fee, usually given if goods are re-exported from the country which collected the fee.Drayage: Transport of goods over a short distance. Some definitions specify that drayage is the transport of goods in which both the trip origin and destination are within the same urban area. Also called cartage. Dumping: Importing goods into a country at a price less than the fair market value. Dutiable value: The amount on which a customs duty is calculated. Duties: Taxes collected on importing and exporting goods. Also called tariffs. EAR: The Export Administration Regulations are published by the U.S. Department of Commerce and regulate exports of dual-use items, meaning items that have both a commercial use as well as a potential military application. ECCN: Export Control Classification Numbers are alphanumeric codes used to identify dual-use items, meaning items that have both a commercial use as well as a potential military application. Knowing the right ECCN for your product plays a role in determining if you need an export license. EEI: Electronic export information is the data that exporters must report to the Automated Export System (AES) via the Automated Commercial Environment (ACE) online web portal. See also, Who is Responsible for Filing the Electronic Export Information (EEI)? Electronic data interchange (EDI): The electronic transmission of business documents such as invoices, purchase orders, and bills of lading. Embargo: A government order restricting the transport of freight to a certain destination. Eminent domain: The power of a sovereign government to take property for a necessary public use. Empty repo: Stands for empty repositioning; refers to the movement of empty containers. Endorsement: A legal signature that signals transfer of rights from one party to another. Entry: Documents needed to clear an import shipment through customs. Equipment interchange receipt (EIR): A document used when transferring a container from one carrier to another, or from one terminal to another. ETA, ETC, ETD, ETR, ETS: Estimated time of arrival, completion, departure, readiness, or sailing. Exception: A delivery in which the driver or recipient notes a problem on the delivery receipt before signing it is referred to as an exception. An exception is usually related to shortage or damage of goods. Exclusive use: A shipper may pay a premium rate in order to obtain exclusive use of a trailer. This means that the container will only be filled with the shipper’s goods and not those of any other party, even if there is additional space on the trailer. Export: Shipment of goods out of a country. Opposite of import. Export license: A government-issued permit that authorizes a shipper to export a certain good or to export to a certain country or party. Download the free white paper, How to Determine if You Need an Export License. FAK: Abbreviation for “freight all kinds.” Typically refers to a full container loaded with mixed cargo. False billing: Misrepresenting freight information on shipping documents. Federal Maritime Commission (FMC): The agency within the U.S. federal government tasked with enforcing laws related to transport of goods by sea. Federal Register: The Federal Register, sometimes abbreviated as Fed. Reg., FedReg, or FR, is the official journal of the U.S. government where new rules and regulations are published. Force majeure: A common clause included in contracts which exempts parties for not fulfilling their obligations due to events beyond their control, such as natural disasters or war. Fore and aft: The direction on a ship parallel to the center line. Foreign trade zone: A special port in which merchandise may be stored without being subject to import regulations. Also called a free trade zone or free port. FPPI: Foreign principal party of interest is the party to whom final delivery of the goods will be made; typically the foreign buyer. Free time: The amount of time that a carrier’s equipment may be used without incurring additional charges. Freight: Any product(s) being transported. Freight broker: A person who arranges transportation on behalf of a shipper. Typically a freight broker will connect small shippers to carriers who can move their goods. Freight forwarder: A company that arranges the transportation of goods on behalf of a shipper. A freight forwarder may have its own in-house carriers or may contract with external carriers. Freight forwarders often specialize in consolidating LTL freight from multiple shippers. FTA: Free trade agreements are made between countries in an effort to reduce barriers to trade between the participating countries. FTR: The Foreign Trade Regulations (FTR) are a set of regulations placed on international trade in the U.S. They are established and updated by the U.S. Census Bureau. It is in the FTR that the requirement to file the Electronic Export Information (EEI) through the Automated Export System (AES) can be found. See also, Why Is the Census Bureau Monitoring Your Exports? Full truckload (FTL): A full truckload carrier is a carrier that contracts the entirety of a truck’s carrying capacity to a single customer. Often referred to as simply a truckload carrier. General order: When U.S. Customs orders shipments without entries to be kept in their custody. Gross vehicle weight (GVW): The total weight of a vehicle including the weight of the vehicle itself and any attached containers. Harbour: A place at which ships stop to resupply and load or unload cargo. Harbour master: An official responsible for overseeing the operations of a harbour. Hatch: The opening on the deck of a ship which gives access to the cargo hold. Hazardous materials (HazMat): May be used interchangeably with the term “dangerous goods,” hazardous materials (or HazMat for short) are goods which may pose a threat to safety because they are poisonous, toxic, corrosive, explosive, flammable, etc. More precisely, hazardous materials are defined by the U.S. Department of Transportation in accordance with the Federal Hazardous Material Law. It is more common to see the term “hazardous materials” used when shipping domestically within the U.S., whereas the term “dangerous goods” is used more often when shipping internationally. Shipping hazardous materials may require special documentation or packaging to ensure safety. HS: The Harmonized System is an internationally accepted system used to classify products. The first six digits of an HS code are universal across all countries, but each country will add additional digits to further specify products. HS codes play a role in determining import and export controls as well as duty rates. IMDG: International Maritime Dangerous Goods code; the regulations established by the International Maritime Organization (IMO) for the international transport of dangerous goods. Import: Shipment of goods into a country. Opposite of export. Import license: A government-issued permit authorizing a party to import a good into the country. In bond: An import or export shipment that has not yet cleared customs is referred to as in bond. Incoterms: Incoterms are universal trade terms published by the International Chamber of Commerce (ICC.) They consist of three-letter codes that are intended to clearly communicate the tasks, costs and risks associated with the transportation and delivery of goods in an international transaction. They describe how responsibility is allocated between the seller and the buyer for different parts of the transaction. Download the free Incoterms 2010 Chart of Responsibilities. Interchange point: A location where freight is transferred from one carrier to another. Intermodal: Intermodal transportation is the movement of goods via more than one type of transportation (e.g. air, rail, sea, truck, etc.) An intermodal container is one that can be used in different modes of transport without having to unload the goods and reload them at each point at which the mode of transport changes. In the context of international trade, intermodal container is usually synonymous with container. Inward foreign manifest (IFM): A document listing all cargo entering a country. Required by all world ports and is the primary source from which import duties are assigned. ITAR: The International Traffic in Arms Regulations regulate the export of space- or defense-related products and are enforced by the U.S. Department of State. See also, An Overview of the International Traffic in Arms Regulations (ITAR). JIT: Abbreviation for just in time. A method of inventory control which minimizes warehousing and in which the container itself acts as a movable warehouse and arriving on schedule is crucial. Landed cost: The total cost of goods for a buyer including transportation costs and import duties. Less-than-truckload, less-than-load (LTL): A medium shipment, typically between 150 pounds and 20,000 pounds. An LTL carrier mixes freight from several customers in a single truckload. May also be called less-than-container (LCL). Letter of credit: Also called a documentary collection and often abbreviated as LC or L/C, a letter of credit is a written commitment by a bank issued after a request by an importer that payment will be made to an exporter provided that the terms of the letter of credit have been met as evidenced by the presentation of certain documents. See also, What's a Letter of Credit? (Infographic). License exception: Certain criteria may be met that allow an exporter to export a product without an export license in cases where an export license would normally be required. These criteria are called license exceptions. See also, What You Need to Know about Export License Exceptions. Liquidated damages: The penalty a seller must pay the buyer if a project does not meet the standards or deadline outlined in the sales contract. List: The amount that a vessel tilts from the vertical, measured in degrees. Logistics: The management of the flow of products as they are transported from the point of origin to their final destination. A logistics company is a general term for a company that provides logistics services, which may include freight forwarding, customs brokerage, and/or consulting services. Longshoreman: A port employee tasked with loading and unloading ships. Malpractice: In the context of shipping, malpractice refers to situations in which a carrier illegally gives preference to a customer in order to attract their business. Maritime: Relating to transport by sea. Marking: Letters, numbers, or other symbols placed on packaging used for identification purposes. NCBFAA: The National Customs Brokers and Forwarders Association of America is an organization representing the interests of customs brokers and freight forwarders in the U.S. They publish guidelines on best practices, including specific guidelines on how to create a shipper’s letter of instruction (SLI) when authorizing freight forwarders to file through the Automated Export System (AES) on behalf of the exporter. NEC, NES: Not elsewhere classified, not elsewhere specified. Net weight: The weight of goods not including the weight of their packaging. Non-dumping certificate: Required by some countries to ensure protection against dumping of certain products. NVOCC: A non-vessel operating common carrier behaves like a carrier except it doesn’t provide the actual transportation service itself. Instead, an NVOCC buys space from carriers and sells this space to shippers. On board: A notation on a bill of lading indicating that cargo has been loaded on a ship. On deck: A notation on a bill of lading indicating that cargo has been stowed on the open deck of a ship. Open account: A transaction in which goods are shipped to a foreign buyer without guarantee of payment. Operating ratio: A measure of operating efficiency based on a comparison between a carrier’s operating expenses and its net sales. Origin: Can mean 1) Location where a shipment starts its journey; or 2) Country where goods were originally manufactured. Overage: When the number of units received is greater than the quantity stated on the export documents. Opposite of shortage. Packing list: A standard document which accompanies a shipment. Also called a packing slip, this document lists the products on a shipment along with packaging information but does not include prices. See also, The Importance of an Export Packing List for Your International Shipments. Pallet: A platform on which packages may be loaded. Facilitates easier handling by a lift truck. Parcel/package/small parcel/small package: A small shipment, typically below 150 pounds. Payee: The party paid in a transaction; the seller. Payer: The party paying money in a transaction; the buyer. Payment terms: Terms that describe how money will be paid in a transaction. Typically, the shipper is responsible for payment for prepaid shipments, while the consignee is responsible for payment for collect shipments, unless a third party is indicated as the payor on the shipping documents. Phytosanitary inspection certificate: A document issued by the U.S. Department of Agriculture which certifies that a shipment has been inspected and is free from harmful pests and plant diseases. Used to meet import requirements of other countries. Pier: A structure perpendicular to the shoreline to which a ship is secured in order to load or unload cargo. Place of delivery: Location where cargo leaves the custody of a carrier. Place of receipt: Location where cargo enters the custody of a carrier. POD: Abbreviation for 1) port of discharge; 2) port of destination; or 3) proof of delivery, a document provided by the carrier required to receive payment. Point of origin: The location where a shipment is transferred from a shipper to a carrier. POL: Abbreviation for 1) port of loading; or 2) petroleum, oil and lubricants. Port: May refer to 1) A harbour with piers or docks; 2) The left side of a ship (when facing forward; opposite of starboard); or 3) An opening in the side of a ship used for handling freight. Port of exit: Port where cargo is loaded and leaves a country. PPI: Principal party of interest. See FPPI and USPPI. Prepaid: Freight charges paid by a shipper prior to release of bills of lading by the carrier. Proforma invoice: A document that acts as a formal quote, produced by the seller and given to the potential buyer before a transaction is finalized. See also, How Does the Proforma Invoice Fit in the Sales Process? Quarantine: A restriction placed on an operation in order to protect public health and safety. Quota: The quantity of goods that may be imported without restrictions over a set period of time. Quotation: Usually called a quote for short, an offer to sell goods at a stated price under stated conditions. Rate basis: The formula of specific factors that play a role in determining freight rates. RFP, RFQ: Request for proposal, request for quotation. Reasonableness: Under ICC and common law, the requirement that a freight rate not be higher than what is necessary to reimburse the carrier and allow a fair profit. Relay: The transfer of containers from one ship to another when both ships are controlled by the same carrier. Revenue: Payment received by a carrier for transporting goods. Sanction: An embargo enforced by a government against another country. SCAC: Standard Carrier Alpha Codes are codes developed by the National Motor Freight Traffic Association which are used to identify inland carriers in the U.S. Schedule B: Schedule B codes are used specifically for exporting out of the U.S. They are based on HS codes and used by the U.S. Census Bureau to calculate trade statistics and by U.S. Customs and Border Protection to ensure that exporters are following U.S. export regulations. Ship’s tackle: Equipment such as rigging or cranes used on a ship for loading or unloading cargo. Shipper: In the context of international trade, shipper is a term typically used to identify the company selling the goods to a foreign market. The shipper may also be called the exporter or consignor in this case. Shipper’s letter of instruction (SLI): A document provided by an exporting company to their freight forwarder outlining instructions for the freight forwarder. If the freight forwarder is filing through the Automated Export System (AES) on behalf of the exporter, the SLI includes the information they need to complete the filing. See also, 5 Reasons You Need a Shipper's Letter of Instruction for Your Exports. Shipping documents: Paperwork that accompanies a shipment as it makes its way to the final destination, such as packing lists or bills of lading. Shipping Solutions: An export documentation and compliance software program that makes creating accurate export documents fast and easy. See also, Shipping Solutions Features. Shortage: When the number of units received is less than the quantity stated on the shipping documents. Opposite of overage. Skids: Devices placed beneath boxes or packages in order to raise them off the floor to permit access by a forklift. SOLAS: Safety of Life at Sea Convention is enforced by the International Maritime Organization (IMO). Under SOLAS, exporters are required to provide a verified weight of the goods before they are loaded onto a ship for transport. See also, New Weight Verification Requirements Coming in July 2016. Spotting: Placing a container in a position from which it can be loaded or unloaded. Starboard: The right side of a ship (when facing forward.) Opposite of port. Stern: The backside of a ship. Opposite of bow. Stevedore: Individual or company that employs longshoremen and contracts for the loading and unloading of ships. Stripping: Removing cargo from a container. Stuffing: Putting cargo into a container. Supply chain: A system of interconnected organizations and activities involved in the movement of goods from a supplier to a customer. Surtax: An extra or additional tax. Tail: Backside of a container or trailer. Opposite of front or nose. Tare weight: The weight of a container while empty. Terminal: Also called a container terminal, a location where containers are picked up, dropped off, maintained and kept. Terminal charge: A charge for a service carried out in a carrier’s terminal area. Third party logistics (3PL): A company that provides logistics services to other companies, such as warehousing and transportation. Trailer: A container attached to the back end of a truck. Transshipment: The transfer of cargo from one carrier to another or from one vehicle to another at an intermediate point during the goods’ journey to the final destination. Truck tonnage: The weight (in tons) of a shipment transported by truck. Turnaround: A term used in marine transportation referring to the time it takes between arrival of a ship and its departure. Unclaimed freight: Freight that has not been called for or picked up by the owner or ultimate consignee. Unit load: Packages loaded onto a pallet, in a crate, or in some other way that allows for the goods to be handled as a single unit. This process is called unitization. UN number: An internationally recognized four-digit code used to identify dangerous goods. See also, Creating the ITA Dangerous Goods Form. USML: The United States Munitions List is a list of space- and defense-related products which are controlled by the U.S. Department of State under the International Traffic in Arms Regulations (ITAR). See also, What Exporters Need to Know about the U.S. Munitions List (USML). USPPI: United States principal party of interest. The party that receives the primary benefit from an export transaction, monetary or otherwise. Usually the seller of the goods. See also, How to Determine the USPPI. Vessel: A seafaring vehicle; a boat or ship. Vessel manifest: A document listing details regarding the crew and cargo onboard a vessel. Vessel traffic service (VTS): A traffic monitoring system used by harbour or port authorities used to monitor ships, similar to air traffic control used to monitor aircraft. War risk: Insurance coverage for losses resulting from an act of war. Warehouse: A place for the storage, consolidation and distribution of cargo. Warehousing is the storage of cargo. Wharf: A structure built on the shore of a harbour which facilitates the docking of ships. 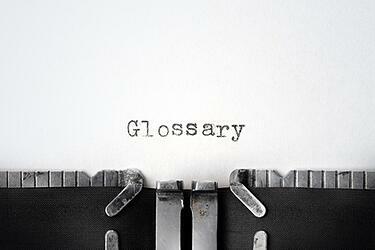 Let me know in the comments below if I should include any other shipping terms in this glossary! This article was first published in October 2017 and has been updated to include current information, links and formatting.